The CATS payload is designed to provide a combination of long-term operational science from the ISS, in-space technology demonstration for future Earth Science missions, and build-to-cost, build-to-schedule development approach. 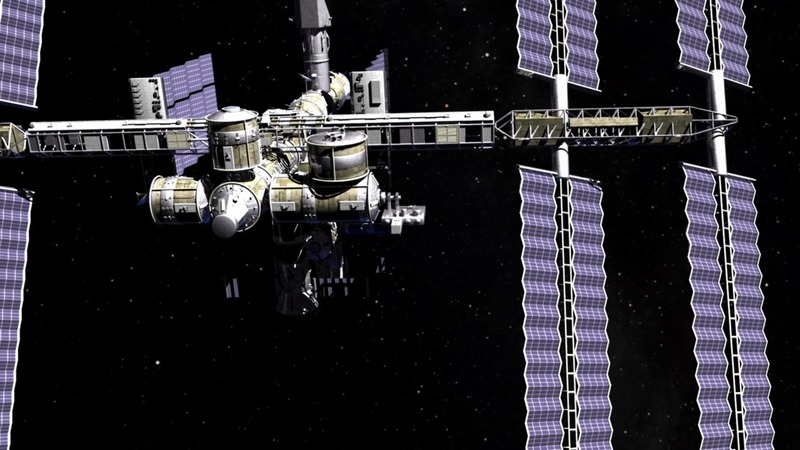 CATS is not a "business as usual" project - it is specifically intended to demonstrate a low-cost, streamlined approach to developing ISS science payloads. 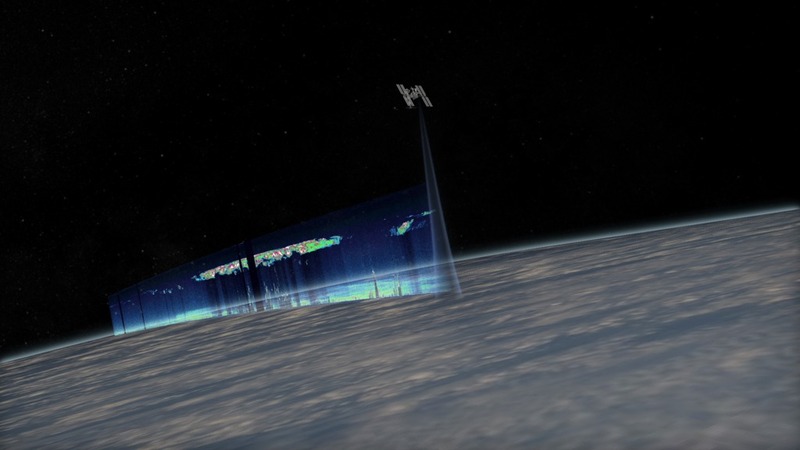 The instrument consists of many new features compared to previous and current space-based cloud-aerosol lidars, such as a high repetition rate laser with photon counting detection, multiple beams, and a seeded laser for high spectral resolution lidar (HSRL) capabilities. 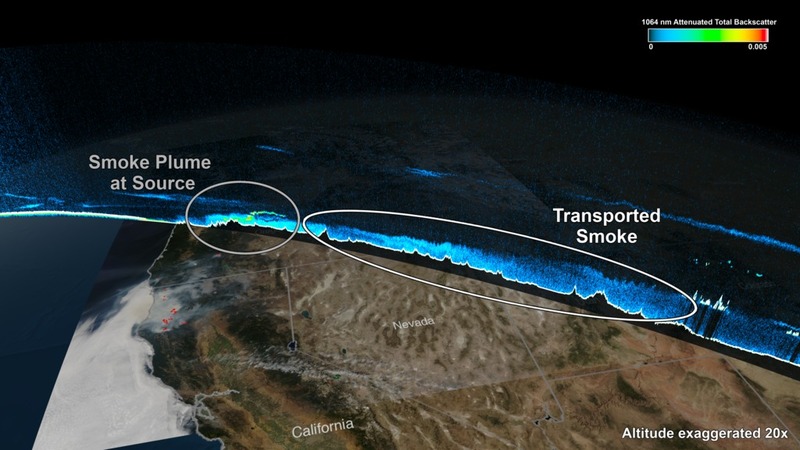 These data products are used for assimilation into aerosol transport models, as complementary datasets to the NASA A-Train sensors, and to maintain continuity in the global lidar climate record. CATS Principal Investigator Dr. Matt McGill discusses the CATS project. On 22 Jan. 2015, CATS was installed on the JEM-EF and powered on. The CATS team watched as the instrument successfully sent health and status data to GSFC for the first time. An artist’s rendering of CATS operating aboard the ISS. The CATS instrument, highlighted by the red arrow, is currently operating on the JEM-EF. The ISS orbit provides more comprehensive coverage of the tropics and mid-latitudes than sun-synchronous orbiting sensors, with nearly a three-day repeat cycle. As a result, CATS provides comprehensive coverage of the tropics and mid-latitudes, where the primary aerosol transport paths are located. Additionally, the irregular orbit of the ISS permits study of diurnal changes in clouds and aerosols. The ISS orbit is a 51-degree inclination orbit at an altitude of about 415 km. Make the system as eye-safe as possible. Use solid state photon-counting detectors. Leverage existing instrument designs and use commercial parts where possible. Fit within mass, volume, and power constraints of the JEM-EF. In recent years there have been significant advances in the approach to lidar design. A now-proven approach to lidar design is to use a high PRF laser, multiple kHz rather than 10's of Hz, at low pulse energies. Ground based systems of this type, the MicroPulse Lidar, have been in use since the early 90's. The airborne Cloud Physics Lidar has been used since 2000. The advantages of the high PRF design with low per-pulse energy permits use of solid-state photon-counting detectors. A basic requirement of the high PRF approach is a narrow field of view (along with narrowband filtering) to minimize solar background noise. The narrow FOV minimizes multiple scattered signals. 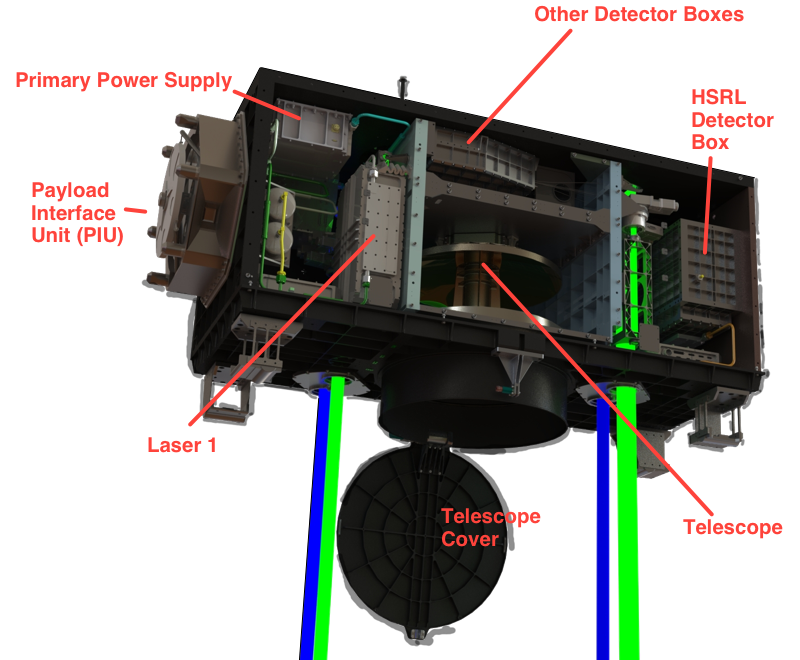 The overall instrument design is driven by the desire to use photon-counting detection. The system transmits three wavelengths (1064, 532, and 355 nm) simultaneously and collinear. Return signal collected by the telescope is separated by use of dichroics. The return signals are further separated into polarization components. The laser units are provided by Fibertek, Inc., as is the avionics/communications package. Mechanical design services are provided by Design Interface, Inc. 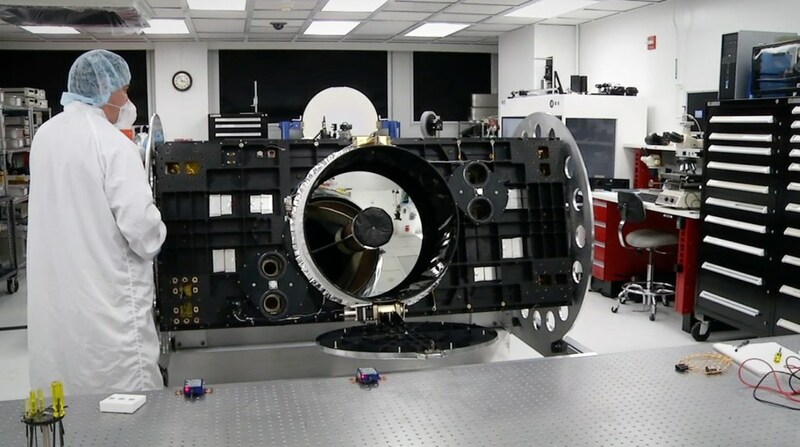 The Fabry-Perot interferometer in the HSRL receiver was provided by Michigan Aerospace Corporation. 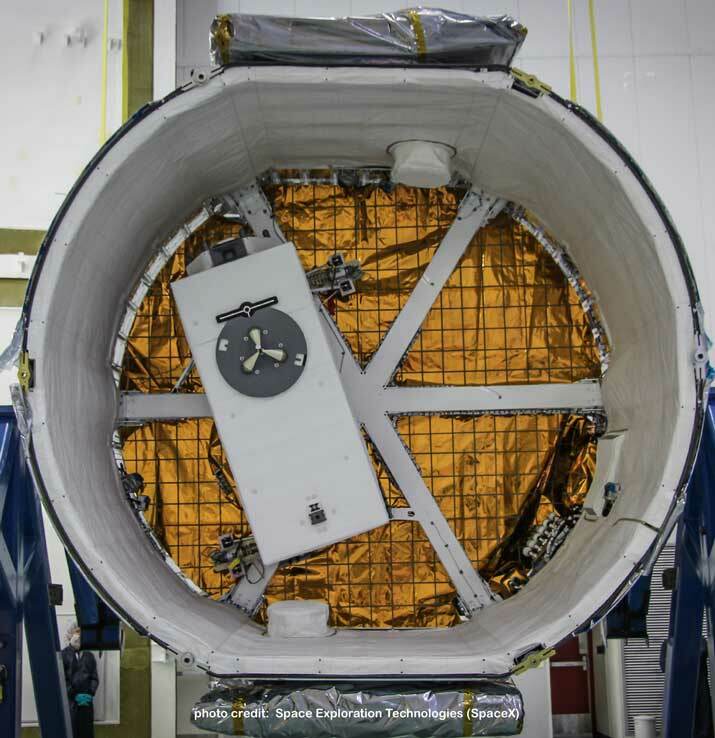 On 30 Sept. 2014 CATS left NASA GSFC for SpaceX facilities at Cape Canaveral, where it arrived a day later. 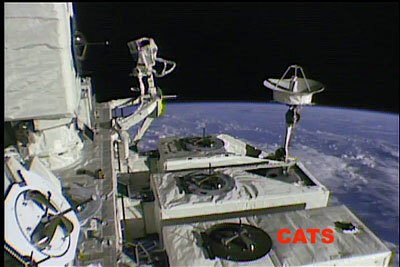 CATS installation on the SpaceX dragon capsule was completed on 08 Oct.
A closer look at the CATS instrument as it orbits the earth aboard the ISS. The ISS passes over a plume of ash and sulfur dioxide (SO2) from the Calbuco Volcano eruption. The volcano plume can be seen in attenuated backscatter data collected by the CATS instrument, onboard the ISS. The ISS passes over a region of wildfires in Oregon. Smoke from the wildfires can be seen in attenuated backscatter data collected by the CATS instrument, onboard the ISS. Provide near real-time (NRT) observations of aerosol vertical distribution as inputs to global models. The vertical profile information obtained by CATS, particularly at the 1064 nm wavelength and with depolarization information obtained in Modes 1 and 2, provides height location of cloud and aerosol layers, as well as information on particle size and shape. 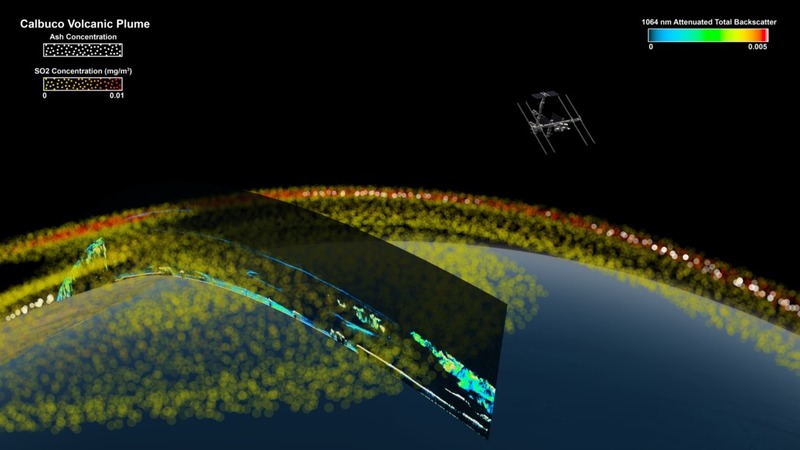 Using the instantaneous data downlinking of the ISS, CATS data products are produced within 6 hours of collection and sent to aerosol forecasting groups to be assimilated into models. Extend the space-based lidar record to different local times of day. The CATS instrument will provide measurements of cloud and aerosol profiles similar to CALIPSO, but at different local times each day compared to CALIPSO. Thus, CATS fills in the data gap between the twice-daily CALIPSO measurements so this information can be used to improve our understanding of the diurnal effects of clouds and aerosols. Additionally, heritage data products are produced to provide continuity in the global lidar data record. Advance technology in support of future space-based lidar mission development by demonstrating the ability to retrieve vertical profiles using a high rep rate laser and photon counting detection, multiple beams, and a seeded laser. Mode 1 Multi-beam backscatter detection at 1064 and 532 nm, with depolarization measurement at both wavelengths. Mode 2 Demonstration of seeded laser, with standard backscatter and depolarization measurements at 1065 nm. 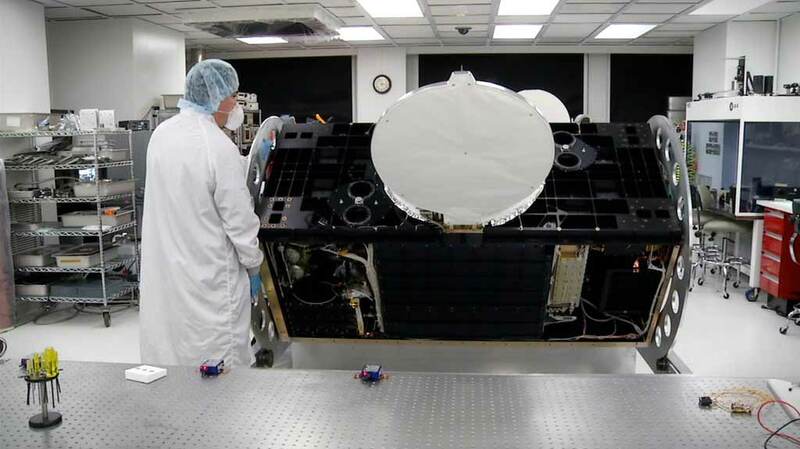 On October 30, 2017 the CATS payload appears to have suffered an unrecoverable fault in its onboard power/data system. Attempts to regain communication with the payload have been unsuccessful. 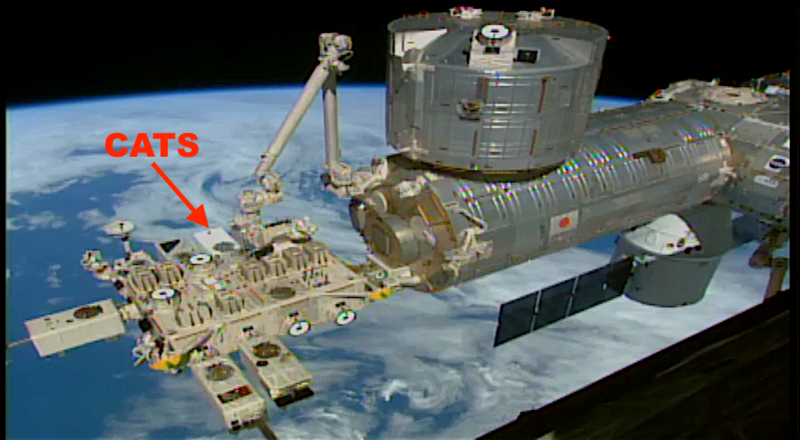 The ISS and JAXA teams are working with us to assess the situation. Although there remains a small chance that communications can eventually be restored, at this time we have no reason to believe the payload will reactivate. Although CATS has ceased science operations, it has been nothing but a complete success. The minimum success requirement levied on CATS was to operate 6 months on-orbit, and longer if possible. 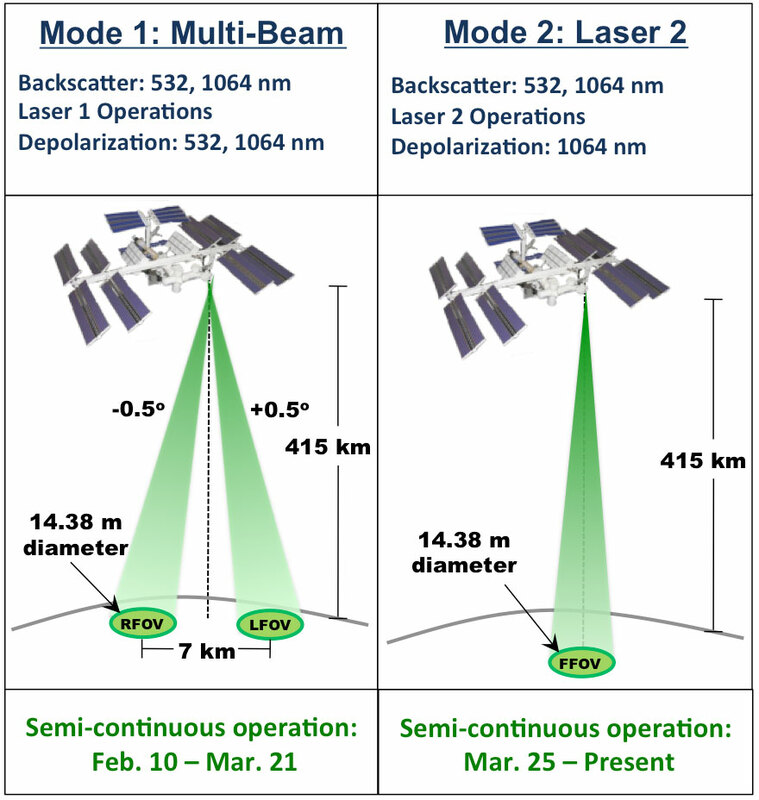 As of October 2017 the CATS payload had operated for more than 200 billion laser pulses - an absolutely unprecedented achievement for a spaceborne lidar - and collected science data for over 33 months. CATS has demonstrated on-orbit measurements of cloud and aerosol properties in near-real time (i.e., within 3-6 hours of data acquisition), enabling assimilation into models and monitoring of hazard events (dust storms, fires, volcanic eruptions). Over the next few months we will continue to refine algorithms, do any reprocessing of CATS data, and then final archiving of the data products. We will post the CATS Image of the Week through end of December 2017, as we have a backlog of results to share. Please check back for a status update on the final data products and thank you for your continued interest in CATS data! CATS was inhibited Saturday October 14th and Sunday October 15th for the Progress 68P launch and docking after the aborted launch on Thursday. CATS will be inhibited the morning of Thursday October 12th, GMT 285, for the Progress 68P launch and docking. For information about the Cloud-Aerosol Transport System, status, or data availability please contact the CATS group. 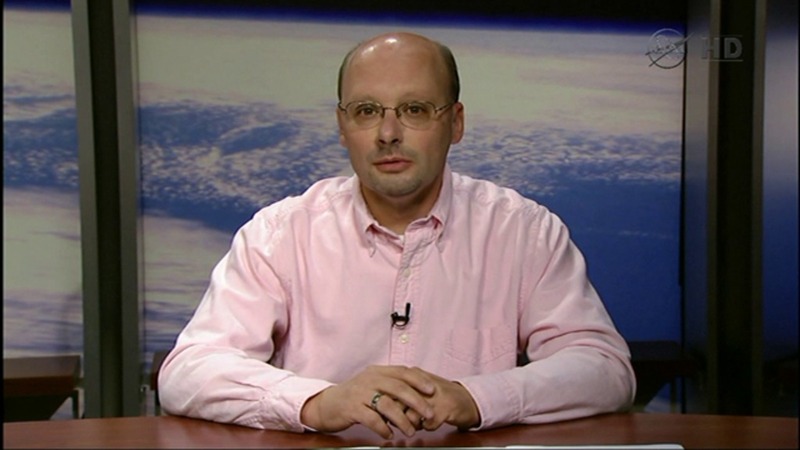 The Principal Investigator and Payload Developer for CATS is Dr. Matthew McGill.